Today, after the intensity of Good Friday, I wanted to take a quiet moment and take a look at this scene, which honestly is one of the most beautifully done, yet heartbreaking moments immediately after the Passion. There is a lot of fear and chaos going on in the immediate aftermath of the Crucifixion. Judas has taken his life in despair, the Twelve have been scattered and are in hiding, and things look bleak. But one disciple, the Beloved Disciple, John, was at the foot of the Cross with Jesus, and Jesus speaks to him. 25 Standing by the cross of Jesus were his mother and his mother’s sister, Mary the wife of Clopas, and Mary of Magdala. 26When Jesus saw his mother and the disciple there whom he loved, he said to his mother, “Woman, behold, your son.” 27Then he said to the disciple, “Behold, your mother.” And from that hour the disciple took her into his home. 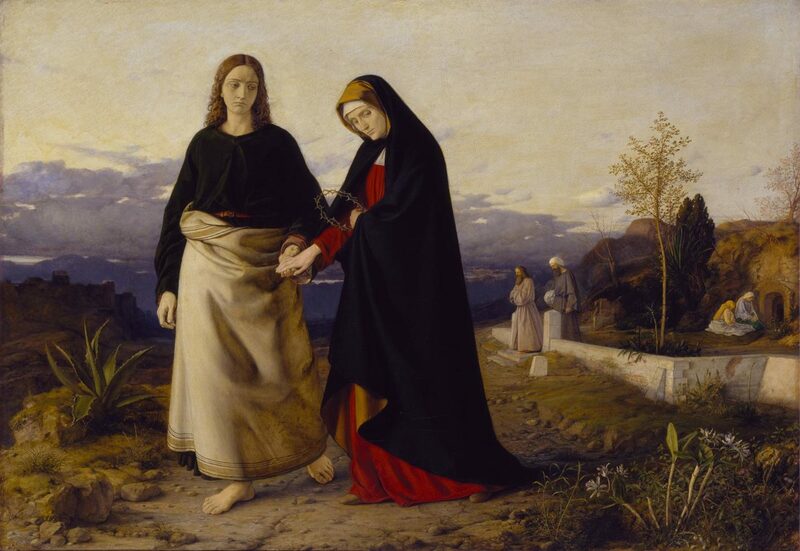 St. John Leading Home his Adopted Mother, by William Dyce, c. 1842-60. Tate Museum, London, United Kingdom. Mary holds the crown of thorns in her left hand, while John holds her right hand and leads her away from the tomb in which they have just laid Jesus in. She looks defeated and John looks concerned for her — as he should be, since she’s his adopted mother now! In the background to the right, two men, probably Joseph of Arimathea and Nicodemus, head home for the Sabbath after wrapping Jesus’s body for burial according to Jewish custom, as was written in the gospel. Two women linger, praying at the tomb, presumably Mary Magdalene and Mary, the wife of Clopas. In the background to the left, Jerusalem lingers under a heavy cloud, dark and ominous looking, especially in contrast to this garden scene. It’s a quiet scene of them leaving the tomb to attend to the Sabbath and contemplate the enormity of everything that just happened. And, in many ways, it is a bittersweet scene. Mary has just been given the motherhood of all that follow Christ — an enormous honor! — that John immediately recognizes and acts upon by taking her into his home as his own mother. The sweetness of being the mother of not only God but now of the church would be palpable. And yet, she has just watched her son be humiliated, tortured, and executed in a particularly horrifying way. And so it is fitting that she is carrying both reminders of her children in both her hands — in her left hand, the crown of thorns, as she is the Mother of God. In her right hand, the hand of John, the Beloved Disciple, who is one of the first Christians — and the only one who was at the cross. So, she is the Mother of the Church as well. But, oh! What a bitter title to earn! I love this post with the Stabat Mater.William Duce is a favourite painter of mine.Sadly he is ignored here in Scotland, which has become in many respects, a rather nasty secularist little country.